There was a tear in the eye of AFC Rushden & Diamonds vice-chairman Jon Ward as he reflected on a tumultuous night at Hayden Road on Tuesday. Andy Peaks and his players delivered a third promotion in six seasons since the club was formed by supporters from the ashes of Rushden & Diamonds. It means Diamonds will be playing at Step Three for the first time in their short history next season and it clearly meant a lot to those behind the scenes. The summer switch to Hayden Road came with its own challenges but a group of volunteers worked hard to ensure the ground was ready for the start of the Evo-Stik South League East campaign. 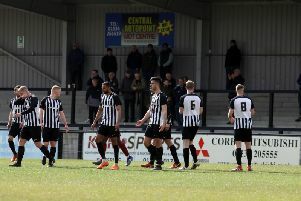 And it has turned out to be a season to remember as the team secured one of the two automatic promotion places in emphatic style with a 7-1 demolition of Aylesbury FC. It left many overcome with emotion and Ward had to hold back the tears as he delivered his own verdict on it. “It’s absolutely fantastic,” the vice-chairman said. “To be here now, from the play-off hurt of last season and the season before, changing leagues and changing grounds and everything that has been thrown at us, and to get to what we have achieved, it’s just fantastic. “We wouldn’t be where we are without the volunteers around the club, they are amazing and I thank every single one of them. “It’s just as much them who got us here as the team. They got the ground ready for the start of the season. We couldn’t have asked for anything more from the past few months. “And the team have delivered for us. It’s very easy being a fan first to think with your heart but you have think with your head and look at the long term. “There was no question that we were always going to stick by the manager. Once this season is wrapped up following Saturday’s home clash with Ashford Town (Middx) in which Diamonds could yet claim the title, the new challenge of ensuring the club can compete at Step Three will commence. Diamonds have held their own against the likes of Kettering Town, St Neots Town and Hitchin Town from that level in cup competitions this season. And while Ward insists sustainability will be key, he believes the club can look forward to life at a higher level. “We are very much up to the challenge,” he added. “It’s about being sustainable and that’s key and we won’t deviate from that.